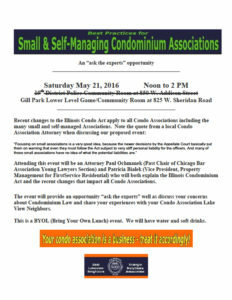 Attending this event will be an Attorney Paul Ochmanek (Past Chair of Chicago Bar Association Young Lawyers Section) and Patricia Bialek (Vice President, Property Management for FirstService Residential) who will both explain the Illinois Condominium Act and the recent changes that impact all Condo Associations. The event will provide an opportunity “ask the experts” well as discuss your concerns about Condominium Law and share your experiences with your Condo Association Lake View Neighbors. This is a BYOL (Bring Your Own Lunch) event. We will have water and soft drinks. Download the flyer to post in your condo building. This entry was posted in Community News and tagged condo, seminars on May 12, 2016 by elvn_updates.